A Sierra Mac crew on the pinnacle of American commercial rafting: Cherry Creek / Upper Tuolomne near Yosemite (Sierra Mac River Trips). Throughout California’s mountain ranges – the Southern Cascades, the Coast, and especially in the Sierra – a rare combination of ideal terrain results in desirable river topography. The Sierra in particular delivers rivers with a universal profile; streams flow east to west, they’re class V at the higher elevations, fall in difficulty about every twenty miles, and then gradually mellow to class I in the Central Valley. These multiple factors create an almost unmatched catalogue of rivers for every type of paddler. And this season, unlike many recent drought years, pretty much everything will be running. 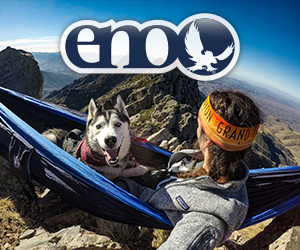 If you are thinking about planning a trip, this is the best year in a long time. Here are some California rivers to consider, broken down by difficulty. First-timers – especially in a high water year – ought to consider hiring a guide service and running “class III” on the international scale of I-VI. Class III is great for novices, but still serious enough that you’ll want to go with professionals. 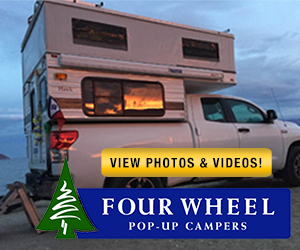 Your outfitter will rent you, or include in the price of the trip, a wetsuit, spray jacket, and personal safety gear, and provide you with an excellent guide. // THE SOUTH FORK OF THE AMERICAN RIVER has two sections of class III whitewater over 21 miles from Chili Bar – near Placerville – to Folsom Lake. 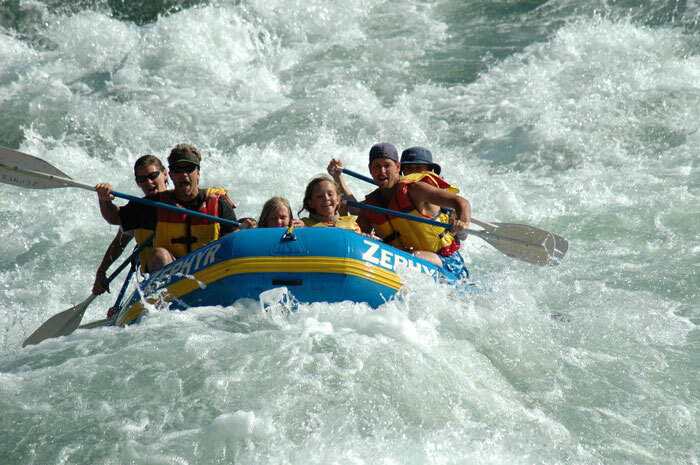 The South Fork is famous for an abundance of great rapids. This river runs year-round, and even after spring flows subside, dam releases deliver whitewater all summer. The gnarlier, more notable rapid names here are Meatgrinder, Troublemaker and Satan’s Cesspool. This is one of the best family trips in the state. River runners on the South Fork American (River Runners). // THE KINGS RIVER nearer Southern California and Sequoia Kings National Park is one of the largest-volume rivers run in the state. It flows clear and cold from the High Sierra, unfettered by dams in its upper reaches. That means it’s usually only running in the spring. This year, though, it’ll certainly be running into August, when you’ll appreciate cooling down with a splash. And there’s a lot of that! This is a terrific family trip over ten miles with fewer rocks, but big smashing holes and satisfying drops like Banzai and Fang Tooth. Outfitters run one and two-day trips on the section, and you’d enjoy combining it with a visit to the nearby national park. 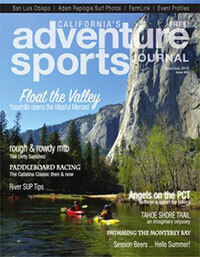 The Kings River will be running through August this year (Zephyr Whitewater Expeditions). Every bit of California whitewater will be fun to run this year, but hearty beginners and experienced paddlers will enjoy the step up to class IV whitewater. It’s a thrill, but won’t be terrifying for athletic newcomers. Still, you’ll want an experienced guide with excellent equipment to ensure you’re having fun and making memories. // THE KERN RIVER near Bakersfield has the most diverse set of whitewater offerings of any single river in California. 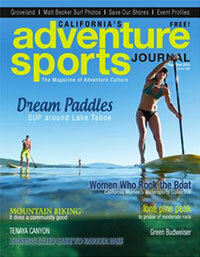 It’s a reasonable drive from SoCal and provides great adventure experiences for all kinds of paddlers. In drier years and higher years like 2019 flows might limit what’s available when too high or too low. 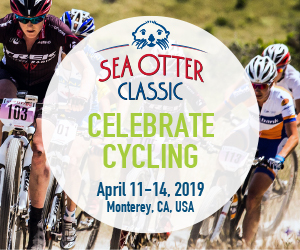 But there’s nearly always something going – from class IV for fit, adventurous beginners, to some of California’s best, multi-day class IV/V trips. It’ll all be pumping this season. // THE KAWEAH is slightly closer to LA than to the Bay Area – just east of Visalia. But it’s well worth the drive from either. Like the Kings, it’s an undammed, purely snowmelt-fed stream. 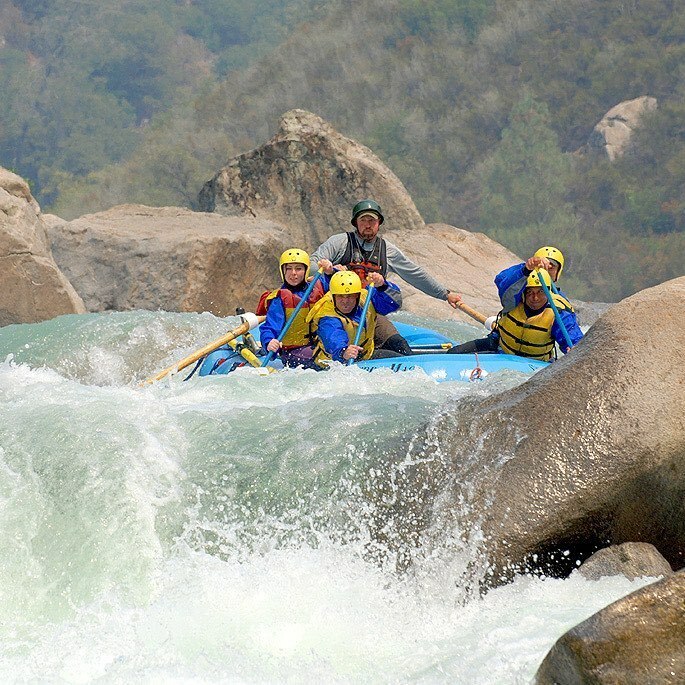 The Kaweah is a nearly-ideal class IV trip in a wonderful, quiet part of the state with about a dozen sizable rapids over ten miles. It will likely run this year through July. // THE MERCED is fed by Yosemite Valley, and is a class IV spring classic. It’s punchy, splashy fun. And you’ll nearly forget that Highway 140 is right alongside for most of the way. “Ned’s Gulch” gets any paddler’s heart pumping. There’s easy, spring access to this section, and you can run a day trip there and still enjoy the calmer waters in Yosemite Valley if you can get in. 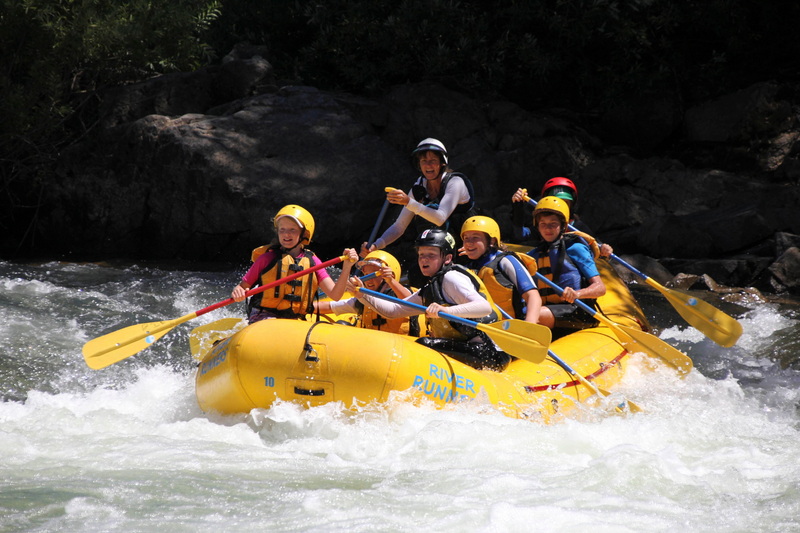 Class IV Merced River (Gary Pearl / courtesy of OARS). // THE TUOLUMNE also originates in Yosemite – but flows from the high meadows in the park instead of out of the Valley. “The T” is higher-brow mid-Sierra whitewater. At big flows, the 18 miles can be easily run in a day. But it’s best savored more slowly as the ultimate California multi-day trip. The Rockies have classic, week and multi-week trips. The Tuolumne, though, delivers a rush of a class IV experience for Californians who have to get back to work on Monday. The Tuolumne runs high in the spring with snowmelt, and generally all summer long from reservoirs and daily dam releases. // THE NORTH FORK AMERICAN is one of the American River triplets. And in the spring, it’s our favorite. This run only happens via national spring runoff, but this year, it will surely be running into June. The common section, called Chamberlain Falls is solid class IV, with moves that hint at the feeling of a class V run. Bogus Thunder and Staircase are two of the marquee, memorable drops here. Just 40 minutes east of Sacramento near Auburn on Interstate 80, it makes for a superlative day trip with one of the several excellent outfitters that run this section. 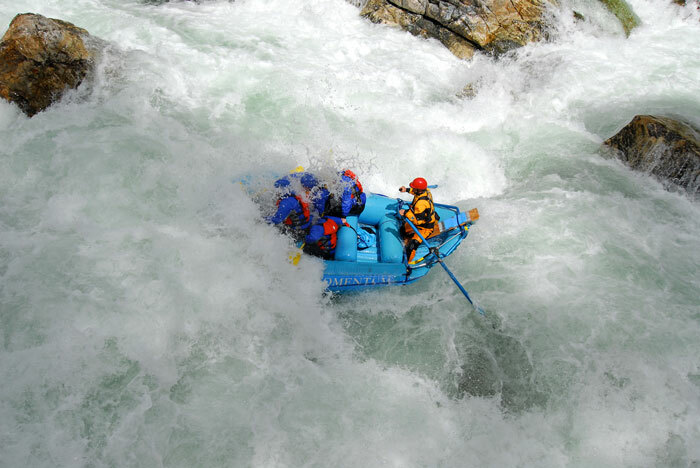 In California the most challenging guided whitewater is typified by a steep gradient and pushy hydraulics flowing through mazes of vehicle-sized granite boulders requiring expert navigation and maneuvering. // THE CAL SALMON, not to be confused with a famous Idaho river named for the same fish – is one of the best trips in California. The drive to get to far, far Northern California means you’re committed. But seriously, it’s worth it. You’ll likely stay for a few days to catch world-class, heavy hydraulics and big drops like Cascade and Freight Train. Sometimes an outfitter will steal a day with you on a second river like the Scott – another esoteric class V gem. The place is remote, and with that you get natural beauty and verdant forests not seen in many of the southern rivers in the state. “Freight Train” on the class V Cal Salmon (Courtesy of Momentum River Expeditions). // THE FORKS OF THE KERN starts with a unique twist: a three-mile hike with mules carrying all the gear. Without hyperbole, this trip is amazing. These 22 miles of hydraulic snowmelt might comprise the best class V multi-day trip in America. Serious trips like this need an optimal flow window; high water this year means it will probably run only in August. 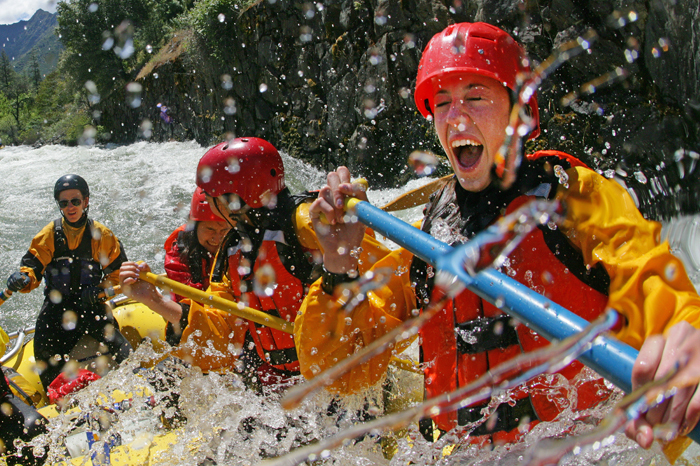 // CHERRY CREEK, UPPER TUOLUMNE might be double-black diamond whitewater, and it’s the hardest single day of commercial rafting in North America. Fortunately, you’ll have the best guides in the business. Paddlers with ambitions to run Cherry Creek on the Upper Tuolumne will have to pass a fitness and swimming test the morning of the trip. As with The Forks, Cherry Creek requires a sweet spot flow, and it probably won’t run this year until August. But that’ll give you time to work up to it with the rest of these fantastic California trips. 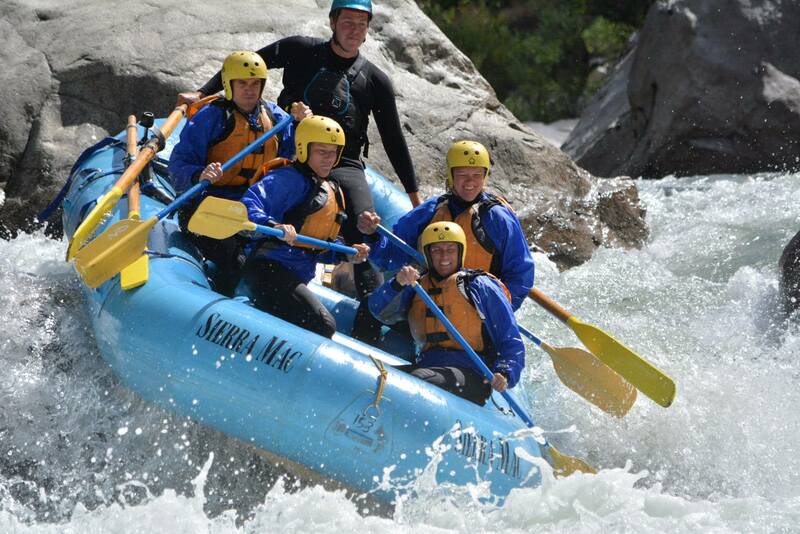 Class V Cherry Creek/Tuolumne near Yosemite (Courtesy of Sierra Mac River Trips). Barry Kruse began guiding class V California rivers more than 30 years ago. 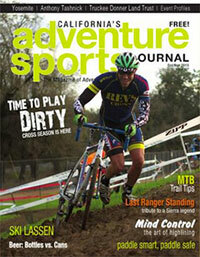 He’s the author of the forthcoming book Leading Steep: Lessons in Leadership from the World’s Great Adventure Guides. Kennedy Kruse, his daughter, is a solid class III guide at age 15. ASJ partners are listed below in bold. Please support our partners.